The Universalists were the first religious group in North Carolina to espouse a theology based on a belief in universal salvation-stressing that, since "God is love," there can be no endless punishment or hell for sinners in the afterlife. The first Universalist minister in North Carolina was Abner Kneeland, who preached in Wilmington in 1825. Two years later Jacob Freeze settled in Wilmington, where he began to publish the Liberalist. Also in 1827, the Southern Convention of Universalists was organized in the hope of bringing "Universalists into acquaintance with each other, to unite their energies, and make arrangement for preaching." At that time one of the few Universalist churches in the South was the First Universalist Church of Sampson County. Hopes for a Universalist organization in the South faded, although the denomination continued to survive in small numbers well into the twentieth century. Unitarianism is a faith based on individual freedom of belief, the free use of reason in religion, a united world community, and liberal social action. While Unitarian churches existed in Georgia and South Carolina before the Civil War, no efforts were made to organize permanent congregations in North Carolina until after World War II. The first Unitarian congregation to be organized in the state was in Charlotte in 1947. It is the largest in the state and has over 350 members. A second church was founded in Asheville in 1950, a third in Greensboro in 1951, and a fourth in Winston-Salem in 1953. The next decade saw the creation of congregations in Greenville in 1961 and Durham in 1966. A fellowship was organized in Franklin in 1976. The 1980s saw the organization of similar congregations in Fayetteville (1987), Hendersonville (1981), Hickory (1983) and Harrisburg, near Concord in Cabarrus County (1988). A lesbian, gay, bisexual, transgender, and heterosexual, "intentionally welcoming congregation" was organized in Kernersville in Forsyth County in 1994. In 1961 the American Unitarian Association and the Universalist Church of America merged to form the Unitarian Universalist Association (UUA). All modern-day Unitarian and Universalist churches in North Carolina are members of the UUA, although the titles used by some churches may vary. Two churches in North Carolina use only the name Universalist in their titles. These are the First Universalist Church of Sampson County, organized at Red Hill near Clinton in 1834, and the Outlaw's Bridge Universalist Church near Seven Springs in Wayne County, which dates from 1905. The congregations at Charlotte, Hickory, and Morehead City use only the name Unitarian. Fourteen other North Carolina congregations are listed as Unitarian Universalist. 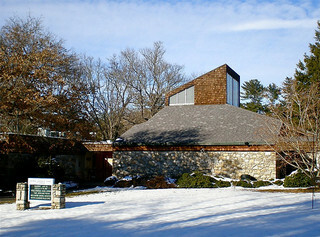 The Community Church of Chapel Hill retains its original name although it joined the UUA in 1993. In the early 2000s there were approximately 4,000 members of these churches along with just over a hundred "friends." Some congregations use the term "fellowship" even though that term is technically used for smaller congregations without a minister. Larger congregations with ministers use the term "church." All of the congregations in North Carolina are also members of the Thomas Jefferson District of the UUA, which includes the Carolinas, most of Virginia, eastern Tennessee, and three congregations in Georgia. Blanche Raper Zimmerman, New Dimensions of the Spirit: The Story of Unitarian-Universalists of Winston Salem (1982). "Unitarian Universalist Church of Asheville (NC)." Available from http://www.flickr.com/photos/melystu/5358546044/ (accessed June 5, 2012). Thank you for using my photo to illustrate this article and for the credit line!